Egypt is "forced" to break the Arab Youth and Sports Ministers’ decision to boycott Adidas, after the sportswear company sponsored the Israeli-organised Jerusalem marathon, as the national team do not have an alternative kit to wear. "We have no choice but to wear Adidas in the UAE camp as we don’t have any other outfits," the Egyptian national team's Executive Director Samir Adly told Ahram Online. The Pharaohs will play three friendly games, Nigeria, Iraq and Benin in the gulf country as they prepare for the continental competitions. Earlier this month, Saudi Prince Nawaf Bin Faisal, chairman of the Arab Council of Youth and Sports Ministers, announced during the council’s meeting in Jeddah that "all companies that have sponsored the marathon in Jerusalem, including Adidas, will be boycotted." Sports apparel manufacturer Adidas was the only non-Israeli sponsor of the race that the sports council consider to be an attempt by "Israel to mislead public opinion into believing that Jerusalem is its capital which is a violation of all UN resolutions." "I hope the Egyptian Football Association (EFA) resolve this problem when we return from the UAE as we currently have no options but Adidas," Adly added. For their part, the association’s spokesman Azmi Megahed told Ahram Online that "they can’t just get rid of the team’s old clothing." "The association hasn’t received any official letter from the sports council about not wearing the Adidas outfits," Megahed insisted. “I am aware of the matter but the team will play tomorrow and we can’t take such a decision on our own otherwise we will be accused of wasting public money," Megahed added. The EFA board have had a turbulent few months since the Port Said disaster on 1 February when more than 70 Ahly fans were killed following a Masry league game. All domestic football activities were suspended due to security concerns. Consequently most of Egypt's clubs have suffered from lack of funds. Ahram Online tried to contact Mr. Emad El-Banani, head of the National Sports Council, to clarify the situation but has yet to receive a reply. Under the guidance of the United States’ former coach, Bob Bradley, the winners of seven Africa Cup of Nations trophies are preparing for the qualifiers to the 2013 edition and the 2014 World Cup. They will play Nigeria, Iraq and Benin (instead of Angola) in their training camp in the Emirates. "I hope the EFA provide the team with new outfits before we play Mozambique and Guinea next month in the World Cup qualifiers," Adly concluded. 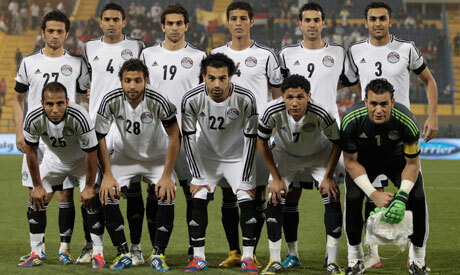 I am Egyptian and I don't care about what Adidas sponsors and what they don't sponsor. Why should I boycott my team's kit provider because they sponsored something for Israel? Are the kit providers supposed to take care of the problems between 2 countries now ? Also this is not even my problem as an Egyptian, this is something that have to do with Palestine. Also Egypt being in a turmoil why do we even have to talk about such silly things ? Of course they have a choice. Do not attend the game at all. Plain and simple. It is just amazing to see what agitates Egyptians -- at least the way Ahram reports it: the country's economy is in ruin, nobody and nothing works and yet it is Israel-bashing that goes into news!! Very responsible journalism, indeed.